Shop til you drop in one of our many shopping centers, malls or neighborhoods. Stockton. Stocked Full of Shopping! Cash in on one of Stockton’s best-kept secrets – great shopping! Browse through the diverse offerings at Lincoln Center, the Miracle Mile, or check out the upscale shops at Stonecreek Village. Antique lovers, get ready for a treat! Quaint shops and flea markets pop up throughout the city of Stockton. Pacific Ave. and Robinhood Dr.
Stockton's Guide to Flavor+Fun! 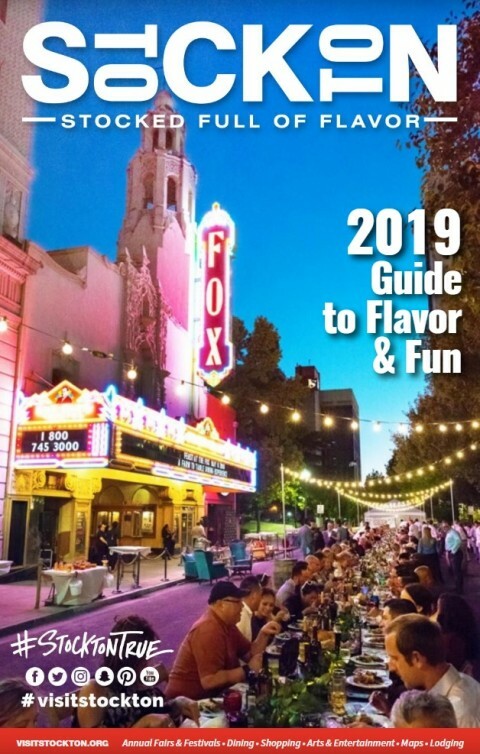 The essential guide to all things Stockton, California for visitors and residents alike including Stockton's annual events, restaurant, attractions, hotels, maps, and more. Stock up on your Stockton swag with souvenirs from Visit Stockton! Order online or drop by the Visit Stockton office to get yours today. View Stockton from the eyes of locals and visitors through our social media photo wall.